Definitions of water mostly describe what it isn’t: colorless, odorless, tasteless, transparent. In more positive terms, one can think of water as a dynamic substance in constant flux, responsive to the slightest vibration. It’s a shape-shifter, taking the form of any cavity, flowing around obstacles, seeping into crevices and soaking into pores. Water is a solvent, a transmitter of energy, and the very medium of life. It’s hard to imagine a more daunting subject for an artist. 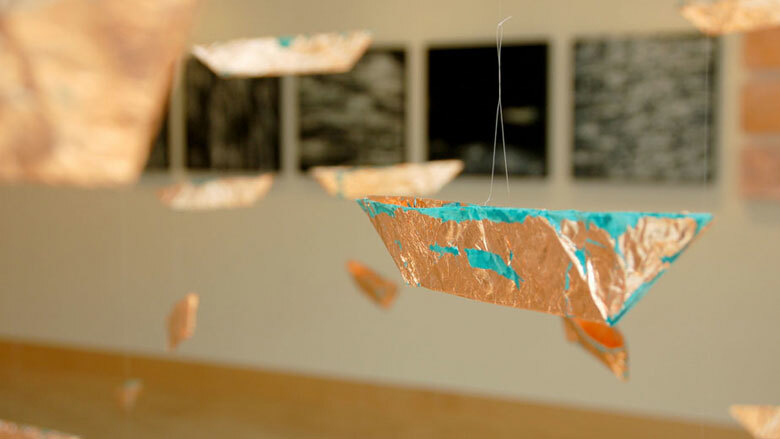 Waterways, an exhibition on view at the James Watrous Gallery this spring, features work by Sarah FitzSimons, John Miller, and Marsha McDonald that investigates the essential nature of water. Through research and patient observation, these three Wisconsin artists have dedicated themselves to understanding the messages conveyed by waves, ripples, and still waters, the deep edges of rivers, and the pull of the tide. In each case, this quixotic pursuit has been repaid in work that is powerful yet poignant, grounded in research as well as a profound respect for the limits of our understanding. John Miller has spent countless hours on the water as a paddler, learning to read the meaning of each riffle and eddy on its surface. As a painter and printmaker, Miller is known for lush landscapes that foreground the rivers and lakes he loves best. His most recent screenprints dramatically narrow the field of vision, zooming in to focus on individual ripples and waves. Composed with strong, calligraphic lines and brilliantly colored, each image isolates and clarifies a specific watery motion. They’re exquisite, as graphically powerful as any of Miller’s previous work. But to an experienced boatsman, Miller’s prints also plumb the depth of the water, the action of the wind, and the obstacles beneath the surface. Like a boater’s lexicon, they codify the gestures of the water’s surface and illustrate how one might “read” the challenges ahead. One can imagine them as teaching tools, extravagantly beautiful flash cards for novices on the water. Sarah FitzSimons’ art practice is driven by her fascination with oceans and geomorphology. In the past, she’s made films and sculptures directly on the ocean’s shore, often playing up the contrast between the waves’ constant motion and the solid geometric forms of houses, tents, or bedsteads. Her more recent work looks directly at the geology of the ocean floor, taking the colloquial ocean “bed” literally by stitching a quilt that represents the Pacific. Gradations in the fabric’s colors mark changes in depth, sewn lines delineate the ocean’s currents, and the bound edges follow the meandering shape of its coasts. Trying to pin down an ocean in fabric is a curious endeavor—and the project’s titanic scale means it may take years to complete—but even FitzSimons’ smaller mock-ups express her profoundly tender image of the ocean as a comforter, gently laid across the land’s sleeping contours. FitzSimons is also casting a series of wave forms in hard, white ceramic. Set out in rows, they have the unsentimental clarity of a scientific diagram. Their chilly mien contrasts starkly with the quilt’s warmth. Marsha McDonald has trained her painter’s eye on moving water for many years, capturing waves and waterfalls in canvases that appear abstract at first glance. In her pictures, dense layers of color mirror the water’s depth and transparency and bold splashes of paint catch the rushing flow of its falls and sprays. While McDonald’s images of water may seem non-specific, her titles often refer to a particular body of water, and each work reflects her relationship with a certain river or stream. Over the past several years she has lived within sight of the Milwaukee River, and her daily observation of its waters has the quality of a devotional act. McDonald has recently ventured into video, filming the river in different seasons and times of day. By masking these video clips, she has created a series of simple, circular images of moving water. She calls these “film beads,” and watching them in succession feels surprisingly similar to passing prayer beads through one’s fingers. They reflect the paradox of water’s nature: repetitive yet ever-changing. In America, we take abundant, clean water for granted. Until drought strikes or a local well is contaminated, it’s easy to forget how fundamental water is to our lives. While the efforts of scientists, managers, and policy makers focus on research, engineering solutions, and legislation to protect our waters, artists like Miller, FitzSimons, and McDonald take a different approach. Through close, deliberate observation, they cultivate an intimate relationship with water, exploring its poetry as well as its physicality. Their artwork inspires us to renew our primal connection with water, to remember the untempered joy of splashing and wading and quenching deep thirst. Quietly, yet insistently, it urges us to give thanks, offer respect, and, perhaps, take an active part in stewarding this most essential resource.